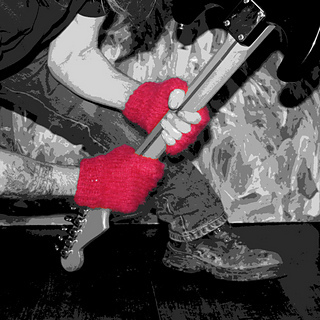 A blast from the 80’s when I knitted dozens of these short finger mitts for friends. They are light as a feather, toasty warm, take only a few hours to knit, use a small amount of yarn (about 150m but more accurate figures later) and are such fun. They also have a story behind them. Only one size is give but altering needle size gives quite a wide range of sizes (check your gauge). I love mohair for these - wild and very forgiving - but any yarn giving a nice fabric and getting gauge will work. I used less than 25g of Emu Filigree Deluxe (from ancient stash), but have used many, many different mohair yarns over the years.